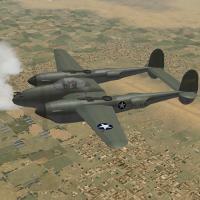 This is a new skin for Wolf257's Lightinig, and my mod of it into the P-38F Lightning. It is desinged to replace the "Generic OD1943" skin for use in your MTO-themed WW2 game install. All new decals for serial and ID letters have been created, to represent aircraft from the 94th Fighter Squadron "Hat In The Ring", 1st Fighter Group as they appeared when in service in North Africa/MTO during late 1942 through late 1943. Hence, the use of the Operation Torch yellow-outlined fuselage star, and the plane star roundel on the wings. Research seems to indicate the yellow-outline was used by the 94th well into 1943, until replaced by the red-outlined star-and-bar, which only lasted a few months itself before being replaced by the blue-outlined star-and-bar. Then they moved up to later model Lightnings, in OD/Gray and then to Natural Metal finish. Serial numbers ARE accurate for F model Lightnings, but I was unable to match ID letters to serials, excepting for UN-Q; that one IS the correct serial. Consider the serials as "generic" for this usage.